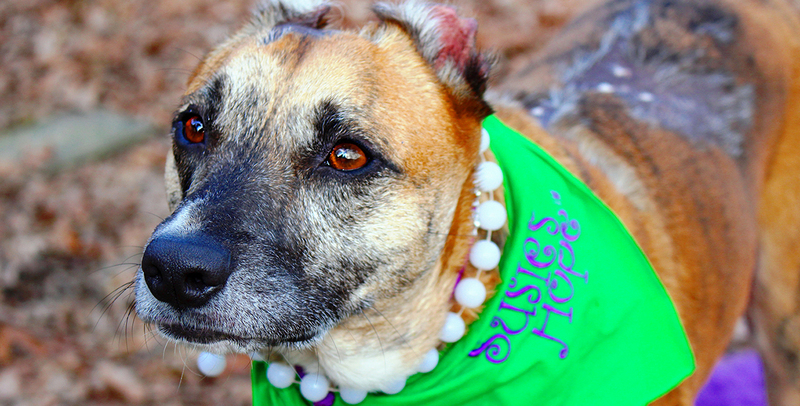 The country's top therapy dog, a pit bull mix named Susie from High Point, North Carolina who overcame a terrible ordeal but went on to bring hope to both people and animals, has been named this year's "American Hero Dog" at the 2014 American Humane Association Hero Dog Awards, presented by the Lois Pope LIFE Foundation, Inc. and broadcast nationally on Hallmark Channel October 30 at 8 pm ET/PT, 7 pm Central Time. Susie was only a puppy when her owner beat her savagely and set her on fire, leaving her for dead in a local park in Greensboro, North Carolina. After being rescued by a local animal shelter and nursed back to health, she was adopted by Donna Lawrence, who had been the victim of a terrible dog attack that nearly killed her and left her without the ability to have children. Together, they helped each other heal from their physical and emotional wounds, triumphing over pain and fear to become voices for abused animals and helping pass "Susie's Law" in North Carolina, which calls for harsher penalties for convicted animal abusers. Susie became the subject of the movie, "Susie's Hope," and working side by side, Donna and Susie continue to make the world a better place for others by visiting hospitals, schools, and nursing homes to inspire people never to give up. This year's therapy dog category sponsor, as well as the campaign's online sponsor, is the leading animal health company, Zoetis. The sold-out, star-studded awards honoring America's most courageous canines were hosted at the Beverly Hilton Hotel last night by television and film star James Denton and model and animal advocate Beth Stern, accompanied by a galaxy of stars and presenters including Bruce Boxleitner, Lacey Chabert, Philippe and Ashlan Gorse Cousteau, Cristina Ferrare, Lori Loughlin, Bailee Madison, Kellie Martin, Marlee Matlin, Brandon McMillan, Larry Miller, Barbara Niven, Pauley Perrette, Charlotte Ross, Mark Steines, Victoria Stilwell, and more. Wilson Phillips provided the lead musical performances, which brought down the house. Before the show, singer and Billboard recording artist Shara Strand treated the audience to songs from her new hit album, "RSVP," and the Harry Kim quintet entertained guests during the Red Carpet, silent auction and gala dinner. Guests were also treated to a Hero Dog Art Show, featuring art works about dogs sent in by children across the country as part of a humane education initiative with Todd Kessler, co-creator of the wildly successful "Blue's Clues" television program and author of the innovative new children's book "The Good Dog." The Hero Dog Awards were created to celebrate the powerful relationship between dogs and people and recognize extraordinary acts of heroism performed by ordinary dogs. The event will be broadcast nationwide by Hallmark Channel on October 30 at 8 pm ET/PT, 7 pm Central. The program will air as part of Hallmark Channel's Pet Project, the network's cross-platform advocacy campaign designed to celebrate the joy and enrichment animals bring to our lives. During a nationwide search, 135 dogs from all across the country were nominated and more than one and a half million votes were cast by the American public, culminating in the selection of eight extraordinary canine finalists. "The American Humane Association Hero Dog Awards were created to honor some of the most extraordinary heroes the world has ever known, the very best of our 'best friends' – ordinary dogs who do extraordinary things," said Dr. Robin Ganzert, President and CEO of American Humane Association. "These courageous canines have gone above and beyond the call of duty, saving lives on the battlefield, comforting the ill, aged and afflicted, bringing hope to those who have lost it and reminding us of the powerful, age-old bond between animals and people. Choosing a top dog is difficult because they are all so terrific, but we are proud to announce Susie as the top American Hero Dog for 2014. We hope that Susie's story will inspire people to realize healing power of the human-animal bond." The winner is chosen through a combination of public votes and voting by a panel of animal advocates and celebrity judges including Victoria Stilwell, Naomi Judd, Prince Lorenzo Borghese, Alison Eastwood, Joanna Krupa, Bailee Madison, Lisa Vanderpump, Emmanuelle Vaugier, Lou Wegner, Christie Brooke, Philippe and Ashlan Gorse Cousteau, Leilani Dowding, Paige Dunham, Joanne Horowitz, Blake Koch, Shara Strand, Agent Jerry Means, Kristin Bauer van Straten, and Victoria Summer. WINNER: Kai (San Antonio, TX)– The San Antonio Fire Department's six-year-old black Lab was rescued from a shelter and given a second chance and a new lease on life. Her nose for finding things was apparent when she was seen digging the only tennis ball out of the shelter's box of toys. After undergoing extensive training, she now helps keep others safe by investigating arson cases by using her powerful nose to detect the common accelerants that arsonists use to commit their deadly, destructive crime. In her four-year career she has taken part in more than 200 investigations and also helps to keep her community safe by teaching children about the importance of fire safety. WINNER: Xena(Johns Creek, GA) – This pit bull was knocking on death's door when she was brought into a Georgia shelter outside Atlanta. Emaciated and dehydrated, she was given just a one percent chance at survival. Unbelievably, she defied the odds, made a full recovery and was adopted by a family with a little boy with autism. Before, the child had closed himself off to the world, but the arrival of Xena sparked something in the child the family had never seen before, and he went from once silent to constantly singing to and chatting with Xena the Warrior Puppy. Now, they're an inseparable pair. WINNER: JJ Krawczyk (Apex, NC)– Once a shelter dog, this small hero was rescued, trained, and partnered with a young girl suffering from a rare condition known as Mastocytosis, which can cause severe reactions for her. This dog with the gifted nose can detect when reactions are about to occur, alerting the girl's parents that her life might be in danger. When she needed surgery recently, doctors requested the dog be present in the operating room to help keep the girl alive. Though she doesn't have a medical degree – or even a pedigree – she's one of the most powerful tools for doctors to keep the young girl's condition at bay. Each of the eight finalists received $1,500 to be donated to one of American Humane Association's charity partners. Susie won an additional $5,000 for her charity. In this way, more heroes may be nurtured. American Humane Association has also been involved in helping military heroes, and has been working with Mission K9 Rescue and the US War Dog Association to bring home and reunite military dogs with their hero handlers. Following an emotional scene during the 2014 American Humane Association Hero Dog Awards in which the audience met Marine Corporal Matt Foster who was reunited with his beloved former military hero dog Mick after a year apart following their service in Afghanistan, noted philanthropist, animal welfare, and disabled veterans advocate Lois Pope announced a pledge of $150,000 to support American Humane Association's efforts to aid and pay tribute to the nation's brave military hero dogs and their former handlers. Mrs. Pope is donating $50,000 to the American Humane Association's "K9 Battle Buddies program" to bring more of these veterans back together on American soil where they can both live out their well-deserved retirements in the way they deserve after a lifetime of service. To bring national attention to these heroes on both ends of the leash, Mrs. Pope is also underwriting a $100,000 special effort to include these military hero dog teams in this year's America's Parade, which takes place on Veterans Day 2014 in New York City. Her generous contribution will give these reunited dog teams their own part in the parade – and a national platform so that millions of Americans can honor them as they should be honored. "The thousands of dogs who serve in our nation's military have sacrificed so much," said Mrs. Pope. "They are often the first line of defense, sniffing out bombs, mines, and other explosive devices. As they did on the battlefield, they can save lives here at home, just by being a companion to the veterans with whom they served. I've witnessed the profound impact that these dogs can have on them. It is my honor to support the efforts of American Humane Association, its K9 Battle Buddies program and its participation in the Veterans Day parade." "Lois Pope has been one of the country's greatest supporters not only of our nation's disabled veterans, whose cause she has championed for decades, but of America's most vulnerable children and animals," said Dr. Robin Ganzert, American Humane Association's President and CEO. "You don't just talk the talk, you make a difference in millions of lives and improve our world. Lois, on behalf of all our veterans -- two-footed and four-footed alike -- we salute you!" The Hero Dog Awards honors heroes "on both ends of the leash," and this year the Hero Dog Awards inaugurated a new element, the American Humane Association Hero Veterinarian and Hero Veterinary Technician Awards, sponsored by the leading animal health company Zoetis. After a nationwide search and tens of thousands of public votes, Eva DeCozio, DVM, of the VCA Apache Junction clinic in Higley, Arizona was named 2014's American Hero Veterinarian, and Signe Corbin of the Westlake Animal Hospital in Austin, Texas was declared 2014's American Hero Veterinary Technician. "To us, all vets and vet techs are heroes and this is why we want to honor the best of the best in their fields," said Dr. Robin Ganzert, American Humane Association's president and CEO. "Indeed, Dr. DeCozio and Ms. Corbin are tremendous animal welfare advocates and we are so proud to learn of their laudable accomplishments aiding the animals in need in their communities. And our thanks go out to our friends at Zoetis for sponsoring this special contest because we know how committed they are to recognizing the achievements of the veterinary community." At one special point of the evening, American Humane Association President brought out and thanked Michael Eisenberg, the Los Angeles developer and memorabilia collector for generously donating a portion of the auction proceeds from the sale of the iconic "Captain America" motorcycle ridden by actor Peter Fonda in the classic film "Easy Rider." Fonda has been a longtime supporter of American Humane Association. "We are blessed and honored to count as friends such notables as Peter Fonda and Michael Eisenberg, and to be associated with this legendary piece of American film history," said Dr. Ganzert. "The sale of the famous motorcycle in 'Easy Rider' will now help to give an easier ride to America's children and animals, who need help from powerful benefactors like these. Thank you!" Finally, American Humane Association honored the many generous sponsors who support the Hero Dog Awards and made them possible. "We thank the animals, their dedicated owners and handlers, and the generous sponsors who have helped bring about that recognition," said Dr. Ganzert. "Thank you to Lois Pope and the Lois Pope LIFE Foundation, Hallmark Channel, national online sponsor, Therapy Dog sponsor and sponsor of the Hero Veterinarian and Hero Veterinary Technician Awards Zoetis, Military Dog sponsor Shotz Natural Energy, Arson Dog sponsor State Farm, Emerging Hero Dog sponsor Trupanion, Guide/Hearing Dog sponsor Chicken Soup for the Soul Pet Food, Search and Rescue Dog sponsor Mission Manager, Service Dog sponsor Modern Dog Magazine, Best Producer sponsor The Beverly Hilton Hotel, and Best Producer sponsor Merial, maker of Heartgard and NexGard. Dogs may be our best friends, but these caring organizations are theirs." Now in its fourth year, the Hero Dog Awards competition searches out and recognizes America's Hero Dogs – often ordinary dogs who do extraordinary things, whether it's saving lives on the battlefield, lending sight or hearing to a human companion, or simply the tail-wagging welcome a pet owner relishes at the end of a hard day. Dogs compete in eight categories for the Hero Dog Awards: Law Enforcement Dogs, Arson Dogs, Service Dogs, Therapy Dogs, Military Dogs, Guide/Hearing Dogs, Search and Rescue Dogs, and Emerging Hero Dogs (the category for "ordinary" dogs).